President Obama claimed his move to normalize relations with Cuba was a means of nudging the military dictatorship toward democracy. He was wrong. The regime is cracking down on dissent harder than ever. Among the arrested were prominent blogger writer Yoani Sanchez; her husband Reinaldo Escobar, who edits 14ymedio.com, an online dissident publication; Eliecer Avila, a prominent democracy activist; and members of the Ladies in White group, mostly wives of political prisoners. Bruguero herself was hauled off by the Cuban secret police and held incommunicado for more than a day until she was released. She said Wednesday they tried to force her to sign a confession, but she refused. So much for “promoting positive change,” which is what the White House claimed would be the result of its move toward normalization. 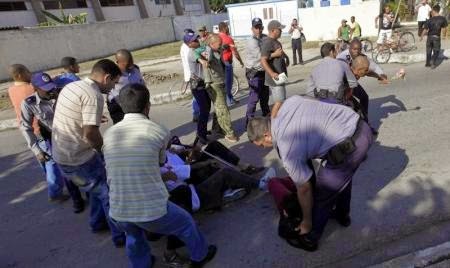 Fact is, the Castro regime sees normalization of U.S. ties as a green light to step up the barbarism. It’s not just attacks against high-profile dissidents. The Miami Herald reported earlier this month that the regime rammed and sank a boat of more than 30 refugees fleeing the island, killing one and jailing the men in the group as they were dragged back to shore. And that underlines the naivete of the Obama administration. “We are separated by 90 miles of water, but are brought together through shared relationships and the desire to promote a democratic, prosperous, and stable Cuba,” the White House website reads. Brought together through the desire to promote democracy? Not according to his new partner, dictator Raul Castro, who put on his military uniform and warned Cubans not to get any ideas from this move, defiantly warning that the communism that has so failed the country would remain in place. There’s little doubt he knows what he’s doing. (CNN) – Vice President Joe Biden sat down with a Cuban media outlet – a significant move given the decades-long tension between the United States and Cuba since the countries ended diplomatic relations more than 50 years ago. In the interview published Tuesday, Biden cited the detention of Alan Gross, an American serving a 15-year sentence as a key obstacle in improving relations. Biden made his comments to 14ymedio, a recently launched digital newspaper created by Yoani Sánchez, a Cuban blogger and fierce critic of the governments of Raul and Fidel Castro. “I cannot emphasize enough that Cuba’s continued detention of Alan Gross is a major impediment to improved relations between the United States and Cuba,” Biden said, according to a translation provided by his office. Gross was convicted in 2011 for bringing satellite communications equipment into the country as part of his work as a subcontractor for the U.S. Agency for International Development. U.S. officials have said Gross was simply trying to help Cubans bypass their government’s stringent restrictions on Internet access. “We can be as creative as we like with our policy, but Alan’s case remains at the top of our list for resolution. 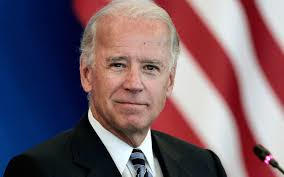 He deserves to come home, and should be released on humanitarian grounds,” Biden said. President Barack Obama also answered questions from Sánchez in 2009, which she posted to her blog. In that interview, Obama responded to a question regarding allegations that his administration was attempting to undermine Cuban authority, throwing cold water on the notion that the United States had plans to invade the island. Sánchez’s journalistic venture was, until Sunday, blocked by users in Cuba. Since the publication’s launch last week, for a few days, users were redirected to website apparently dedicated to slamming Sánchez and government dissidents, according to the Miami Herald. The interview with Biden took place in April, as Sánchez notes in the article, while she was in Washington. Further stoking fears in the Cuban government that Washington is trying to subvert its authority are accusations that the U.S. government tried to flood communications networks with the creation of a cell phone-based “Cuban Twitter,” known as ZunZuneo. The program, which ended in 2012, allowed Cubans to message each other free of Cuban government restrictions on communications and allowed U.S. government officials to send mass messages to Cubans. Opposition blogger Yoani Sánchez stirred controversy in Brazil on Wednesday when she made a ironic comment about the Cuban government’s misuses of money, time and resources in an international campaign for the release of five Cuban spies. She had said that if that they were freed, the Cuban government would save millions of dollars. Hours later, Sánchez clarified her position through several messages sent through social media. Hours after the story was published in El Nuevo Herald, she sent posted this comment on the paper’s home page: “At no moment in Brazil did I ask for the five members of the Cuban Interior Ministry to be free. I was using irony to express my views that if they’re free right now, the government would save millions of dollars that it is now paying in this campaign that has lasted for 15 years. “If the irony didn’t work, if the words that I used weren’t the right ones, I apologize. My position is the same: They’re not innocent.” Sanchez also Tweeted several messages that underscored this view. Sánchez is the creator of the blog Generación Y, a columnist for foreign newspapers, and a prolific user of social media to shed light on life in Cuba. She made her remarks Wednesday during a visit to the Brazilian Chamber of Deputies in Brasilia. Her initial comments spread quickly on the Internet and in South Florida after they appeared on the Viewpoint blog of journalist Joan Antonio Guerrero Vall, a collaborator of Martí Noticias. In her meeting with Brazilian lawmakers, Sánchez also had criticized the U.S. trade embargo, saying it was “interventionist” and has not worked. “As a pressure method, it is a failure. The third reason, and not in order of importance, it should end as soon as possible is that it is used by the Cuban government as the fundamental reason to explain its economic failure and political and social repression,” she said. Sánchez had been denied permission to travel abroad for a decade by the Cuban government, but under a new travel and migration policy Cuba enacted last month, Cubans no longer need an exit visit to leave the island. The blogger quickly took advantage of the new policy and accepted invitations to speak in Latin America, Europe, and the U.S.
Miami Herald reporters Mimi Whitefield and Luisa Yanez contributed to this report. HAVANA — For years, Cuban dissidents say, authorities’ message to them has been the same: Sure, you can leave the country. Just don’t expect us to let you come back. Now, two prominent and outspoken government opponents say they’ve been told they can come and go freely under a new law that eliminated decades-old travel restrictions on nearly all islanders. The government faces some of the same pluses and minuses with all Cubans traveling abroad, showing that it is being more open by letting its citizens leave more easily, but taking the risk that some won’t come back. Travelers seeing the world for the first time are apt to experience things that could give them cause to clamor for more freedoms or material goods back home, or it could make them more grateful for basic guarantees like free health care and education. Some will surely have both those reactions. Cubans of all political stripes lined up outside travel agencies and migration offices when the law scrapping the country’s exit visa requirement went into effect Monday, looking to book flights, renew expired passports or just get information about how the measure would affect them. Among them was Yoani Sanchez, a dissident blogger who has garnered fame overseas for her writings about the frustrations of daily life. Sanchez says she has been turned down 20 times when she asked for permission to travel abroad to accept awards or attend conferences, and authorities told her she would only be allowed out if she was leaving for good. It’s a practice that has been used to rid the island of a number of people considered troublemakers, including dozens of activists who were imprisoned in 2003 during a notorious crackdown on dissent. Under an agreement brokered by the Roman Catholic Church, many of them accepted exile in Spain as a condition of their release in recent years, although some holdouts were freed and allowed to stay in Cuba. Sanchez said that to her surprise, an official told her Monday she will be able to leave and return once she has her new passport, a process that should take around two weeks. Shortly before turning in that night, she tweeted enthusiastically about her intention to visit friends in Canada: “I will dream of embraces, walls that fall and borders that dissolve.” Sanchez will apparently be the first dissident to test the government’s word, but she’s not alone. In interviews with The Associated Press, several others confirmed plans to travel in the near term, including two recent winners of the European Union’s Sakharov prize who were denied permission to collect the award in person. They include Berta Soler, a leader of the Ladies in White protest group, who hopes to organize a delegation of the women to travel to Strasbourg, France, to pick up their prize from 2005. Guillermo Farinas, a noted hunger striker and 2010 Sakharov winner, said state security agents took the trouble of driving out to his home in the central city of Santa Clara to let him know he’ll be allowed to travel and return.